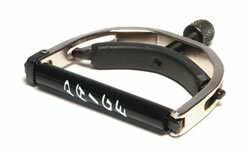 A sleekly designed, controlled tension capo for the banjo or mandolin. Store over the nut. Slide to desired fret and tighten. Wide enough to fit past the 4th fret on a banjo. Thin, light and sleek. Made in the USA.